We’ve compiled tips and tricks for getting around safely and lawfully, ranging from rules on parking to pedestrian do’s and don’ts at intersections. Parking guidelines. Crosswalk procedures. 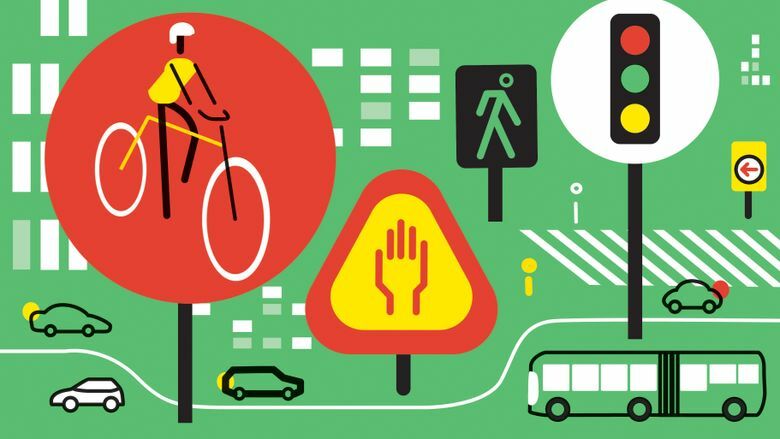 Bicycle safety tips.We’ve explained dozens of roadway rules since Traffic Lab’s launch about 10 months ago, and the questions from readers keep coming. Here is a roundup of some popular topics, ranging from parking to pedestrian do’s and don’ts. Q: Are Uber and Lyft drivers legally allowed to load and unload passengers in bike lanes? A:No. All motor vehicles, whether parking or making brief stops, must steer clear of designated bike lanes, except for emergency and maintenance vehicles dealing with a situation. Last year, officers issued at least 484 tickets to drivers and others blocking bike paths and lanes, an average of about 40 per month. Like many parking offenses in Seattle, the ticket is $47. Q:Where is it safe to park? A: Nowhere within 5 feet of driveways, 15 feet of fire hydrants, 20 feet of crosswalks, or 30 feet of stop and yield signs, without the risk of fines. Curbs with red and yellow stripes indicate bus stops (also no parking), while white or yellow paint designates loading or unloading zones for passengers, taxis or trucks. Those places have parking time limits that range from three to 30 minutes. Also, leaving a vehicle parked longer than 72 hours on any given city street can mean a $44 ticket and the risk of getting the vehicle towed, costing upward of hundreds of dollars. Parking-enforcement officers tend to use the “chalk method” to verify a vehicle’s parking time, which means tagging a tire and then checking if the mark is in the same spot when they return later. Or, officers also take electronic notes for tracking parked cars. Seattle police encourage people to report parking violations by using the department’s nonemergency line, 206-625-5011. Q: What are pedestrians’ rights at intersections? A: Legally, people can step off a curb and cross the street at any intersection, no matter its design. That means even crossings without walk signals, lights or zebra stripes give walkers the upper hand. But at busy street corners, the question of crossing is not just what’s allowed, but also what’s safe.Exercise caution and look both ways. Avoid darting out into roadways, suddenly entering crosswalks so that it’s impossible for drivers to stop, or stepping off a curb once a “don’t walk” signal flashes. Seattle police issued 1,710 jaywalking tickets from 2010 to 2016, with totals dropping steadily each year. Q: While we’re on the subject of crossing the street, do pedestrian push-to-walk buttons do anything? A: Most crosswalk signals in downtown and other dense areas activate on a timed schedule, regardless of whether someone hits a button. Other systems require a tap to change the pedestrian signal, including more than 30 at intersections on Mercer Street, where crews installed a new adaptive traffic light system this past spring. But for pedestrians, there’s no foolproof way to tell which system is which. Q: What’s the rule for drivers at traffic circles? A:Drivers turning left must proceed counterclockwise around the circle, although in certain cases, such as when parked cars are in the way, motorists may make left turns with caution. Seattle police can issue $136 traffic tickets to motorists who disobey this rule. Q: What are the speed limits in Seattle? A: For arterials (which generally have more than two lanes, or two-lane streets divided by yellow stripes), the speed limit is 25 mph, unless posted otherwise. The limit is 20 mph for residential streets. Speeding tickets in Seattle range from $105 to $423, depending on the violation. Q: What type of bicycle equipment is required and prohibited by law for nighttime rides? A:Cyclists riding at night should have front lamps that emit white light visible at least 500 feet away (including those that pulse without going all the way off) and red reflectors in back. Cyclists should angle their headlights down, slightly below bike level, to avoid blinding others. Red taillights are optional. Those can blink, pulse or be constant. Brightly flashing strobe headlights are illegal, since they can distract oncoming cyclists and drivers, make it hard to judge distance or speed, and even trigger neurological conditions that cause migraines or seizures. On average, police in recent years have issued about nine citations involving bicycle lamps and reflectors annually. Got a question for Traffic Lab? Last week, we explained signal timing on Seattle’s Mercer Street, following complaints from pedestrians who said the corridor’s traffic-light system cuts walking time too short. The week before, we sat down with the guy in Seattle who helps connect investigators across the U.S. and Canada with Uber’s data to solve crimes. If you have a question or idea for us, send it to trafficlab@seattletimes.com. We may feature it in an upcoming column.